Makar Sankranti marks the commencement of the Sun's journey to the Northern Hemisphere (Makara raasi), signifying the onset of Uttarayana Punyakalam, and is a day of celebration all over the country. The day begins with people taking holy dips in the waters and worshipping the Sun. Also known as Gangasagar Mela, on this day, people come from all over India for a ceremonial cleansing in the river Hooghly, near Calcutta. In Maharashtra, when two persons greet each other on this festive day, they exchange a few grains of multi-coloured sugar and fried til mixed with molasses and say "til gud ghya, god god bola" (henceforth, let there be only friendship and good thoughts between us). In Gujarat, the pandits consider Sankranti as an auspicious day to grant scholarships and certificates of merit to students who have successfully completed their studies in philosophy. In a Hindu household, new utensils are purchased and used for the first time. 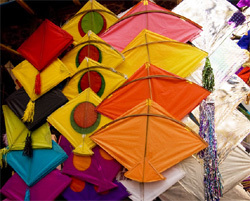 Brightly coloured kites dot the skies on this day. In Karnataka, men, women and children attired in colourful tunics visit friends and relatives and exchange pieces of sugarcane, a mixture of fried til, molasses, pieces of dry coconut, peanuts and fried gram. The significance of this exchange is that sweetness should prevail in all the dealings. As part of the festival, cows and bulls are given a wash and the horns are painted with bright colours and decorated with garland, and are taken in a procession in the village to the accompaniment of pipes and drums. 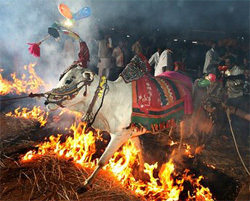 In the night a bonfire is lit and the animals are made to jump over the fire.